NBA and the Business of Basketball: Flopping Penalties are Pointless, Bad Calls will change the outcome of games. D-Wade or should I say D-Flop has a long history of unsportsmanlike flopping, and getting away with it, just like most of his team. He’s finally been penalised with a fine for a rather egregious demonstration of this shamelessness in game 2 of the NBA Finals. This gave Manu his 3rd foul and sent him to the bench. A key play and refereeing error, potentially altering the balance of power at that time of the game. And yet the penalty is only $5000, spare change for a professional basketball player. Essentially, he paid $5000 to change the balance of power at a key point in the game, in a game of basketball, where each call can affect the final outcome, because games can be decided by a single play or basket. This play resulted in a) Manu being removed from the game because of foul trouble (which affects team defense/offense and points scored indirectly in a multitude of ways), and b) Wade gets free throws (+2 free points). This game was decided by 2 points. You could argue that the game’s outcome was directly affected. However we would also need to consider all questionable calls in the game for both teams to establish if there was an overall pattern or bias as well. Unfortunately I did not watch this game so cannot comment on that, but I can say that in games in previous years I have observed patterns of officiating bias in particular games after taking note of all questionable calls throughout a game. Nonetheless, this was a good value $5000 investment for D-Wade. What a pointless slap on the wrist. LeFlop and D-Flop would still each owe at least a billion dollars at $5k per flop, but they almost never get penalised. Players should get tougher penalties like techs or suspensions, and penalties should apply to everyone. If the penalties don’t act as deterrents, then what’s the point? I see this minor penalty as merely a political move to take some heat off the league which takes a lot of blame for giving the Miami Heat special treatment and not penalising their extravagant flopping antics (which from what I and others have observed is much obviously far more prevalent from their players than any other team’s). What a joke the league is today… there appears to be no integrity left in the game. And really this is more the league’s fault for not regulating or penalising such behaviour, not so much the fault of the shameless players that get away with it. It puts into question the legitimacy of the results of many games, because it only takes a one or two bad calls to change the result. This is a game where the subjectiveness and inconsistency of officiating can very easily be the deciding factor in close games. And it seems very likely, from past history, that this has indeed happened, and possibly intentionally, for what would appear to be business and marketing reasons. The Heat are not the only team that have benefited, I should add, but are currently of interest as they are the flavour of the moment. I might go into that in more detail in a future article. 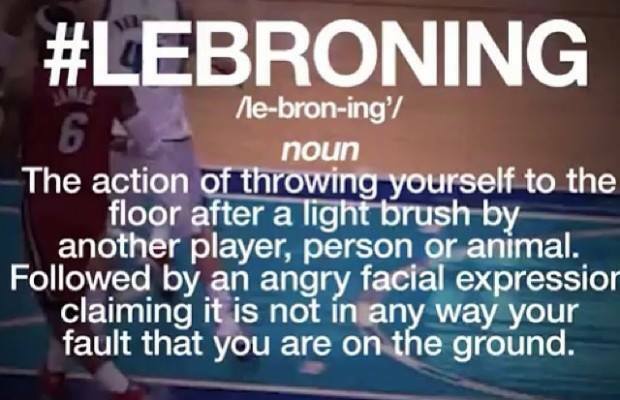 Posted on June 11, 2014, in Basketball, Sports and tagged Basketball, Business, Business of Basketball, Cheating, Flopping, Miami Heat, NBA, NBA Finals, Officiating, Sports, Sports Business, Sportsmanship, Unsportsmanlike conduct. Bookmark the permalink. Leave a comment.